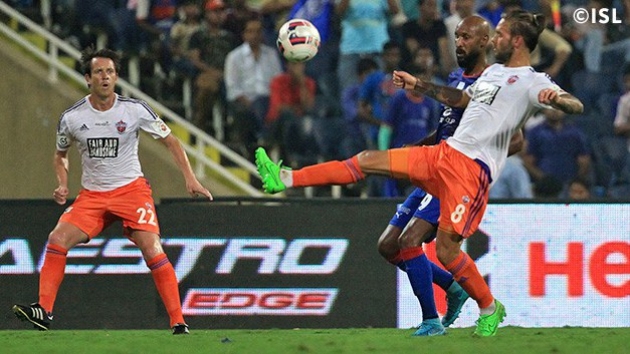 Mumbai City FC were held to a scoreless draw by FC Pune City in the 2015 Hero Indian Super League on Friday evening. This was the second time this season that the league witnessed a goalless draw. Interestingly, Mumbai were also the participants in the previous one, against hosts Kerala Blasters FC on October 10. At the DY Patil Stadium in Navi Mumbai, both Mumbai and Pune created quite a few chances but were unable to score a goal in front of a 23,137-strong crowd. The game got off to a rather subdued start as both sides failed to establish any control of the game for the majority of the first half. In fact, the first opportunity of the game came courtesy of a lapse in concentration from the Pune defence in the 27th minute.